I am fascinated by the Images of America book series. Images of America series by Arcadia Publishing showcases towns and historical place in their books. These books cover the history of towns, cities, counties and more across the United States. Their books are filled with historical images that gives you a snapshot of what it was like in earlier days. One of the first places I look when I go to a bookstore is at the Images of America section. Our local Barnes and Noble has a nice selection of their books, but it doesn't go much beyond our county. You might find one or two from Kalamazoo County. My husband and I were in Grand Rapids, Michigan for a genealogy research trip and ended up at the Barnes and Noble in Woodlawn Mall. Of course, I had to check out their Images of America selection. Some of the local titles they had were: Dutch Heritage in Kent and Ottawa County, Grand Rapids: Furniture City, Grand Rapids in Vintage Postcards 1890-1940, Lowell, and others. They had others from around the state of Michigan, too. I was excited to see Marquette and Manistee County. Two areas that my ancestors were early settlers of. I took a handful of books and found a comfy seat to look at them. My hubby was off looking at his genre, probably science fiction. 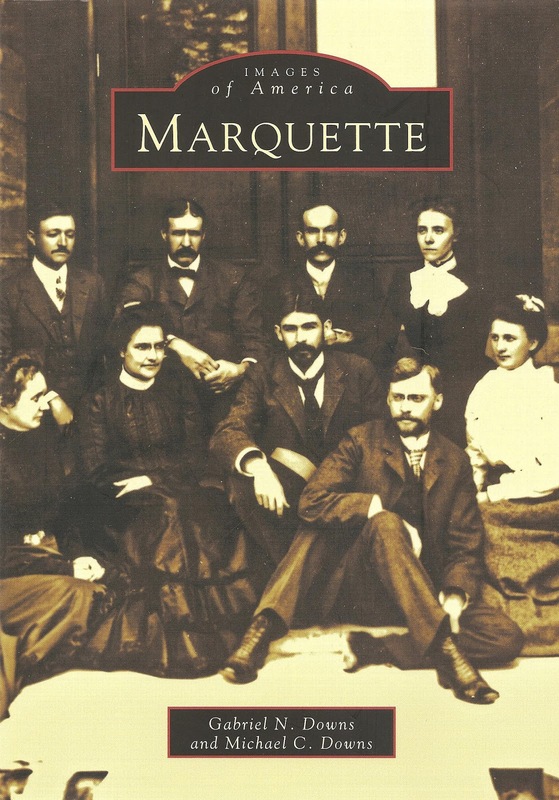 Eventually, I started looking at the Marquette book and boy was I excited. My great grandfather, David Watt, was an engineer for the Duluth, South Shore and Atlantic (DSS and A) railroad in Marquette. I found a picture of the DSS and A depot, circa 1900, on page 60. I imagine my great grandfather pulled up to that depot numerous times. A picture of a DSS and A engine number 4 was found on page 106. Could my great-grandfather be one of the people in the picture? I looked hard but decided he wasn't. I still found the picture interesting. It added 'flesh to the bones' for me. A third picture, on page 124, showed some of the trestle works of the Duluth, South Shore and Atlantic near the ore docks in Marquette. Did my great grandfather travel on this? By this time I had decided I was going to buy the book. It had too many great pictures in it not to. It was in Chapter 9: People and Pastimes. There in the front row, first person on the left, is my grandmother, Sarah Lilla Watt. I am still smiling about this. I had seen this picture in a Marquette High School Yearbook, but to see it in the Marquette book was a pleasant surprise. 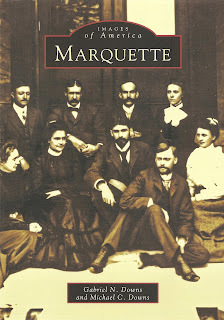 I purchased the book and am still enjoying looking at the pictures that brings to life the people and places of Marquette. Pictures that are entwined in my family history. It doesn't get much better than that.